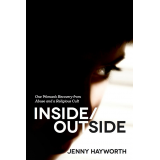 Jenny Hayworth grew up within the construct of the Jehovah’s Witnesses, which she describes as a fundamentalist, cult-like religion. She devoted her life to it for over thirty years. Then she left it. The church “unfellowshipped” her—rendered her dead to those family and friends still committed to the church. Hayworth is a sexual abuse survivor. The trauma changed her self-perception, emotional development, trust, and every interaction with the world. Inside/Outside is her exploration of sexual abuse, religious fundamentalism, and recovery. Her childhood circumstances and tragedies forced her to live “inside.” This memoir chronicles her journey from experiencing comfort and emotional satisfaction only within her own fantasy world to developing the ability to feel and express real life emotion on the outside. Those who have ever felt trapped by trauma or circumstance will find Inside/Outside a dramatic reassurance that they are not alone in the world, and they have the ability to have a fulfilling life, both inside and out.